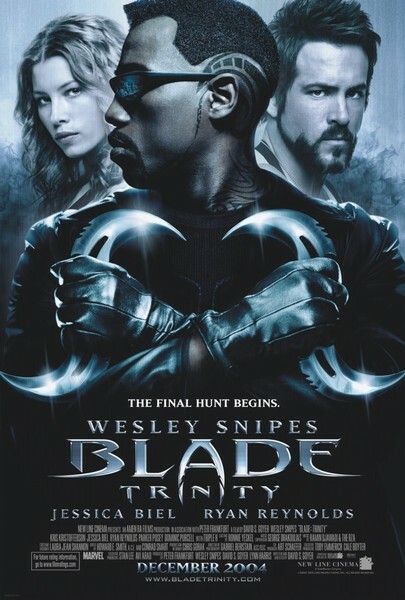 Story: Wesley Snipes returns as the day-walking vampire hunter in the explosive third film in the Blade franchise, Blade: Trinity. For years, Blade has fought against the vampires in the cover of night, with the world above unaware of the brutal ongoing war. But now, after falling into the crosshairs of the FBI, he is forced out into the daylight, where he is driven to join forces with a clan of human vampire hunters he never knew existed - The Nightstalkers. Together with Abigail (Jessica Biel) and Hannibal (Ryan Reynolds), two deftly trained Nightstalkers, Blade follows a trail of blood to the an ancient creature that is also hunting him - the original vampire, Dracula. Blade: Trinity is written and directed by David S. Goyer, who has written all three films in the trilogy, based on characters created in the comic book.